Quella del 1933 fu la terza Campagna della Divisione Navi Scuola (Vespucci – Comandante il CV Panunzio e Colombo – Comandante il CF Bona), la seconda al Comando dell’ammiraglio Bernotti ( comandante della Regia Accademia Navale dell’epoca). Dopo il varo di nave Colombo nel 1928 ci fu la costruzione del Vespucci ( varato nel 1931) e quindi venne costituito il gruppo navale . Il 29 giugno del 1933 dopo l’alza bandiera, con gli allievi della 1a classe dell’Accademia Navale e l’equipaggio già al “posto di manovra” e gli addetti alle manovre volanti con le cime pronte, la Divisione Navi Scuola si accingeva a lasciare il porto di Livorno. Come vuole la consuetudine, i parenti degli Allievi e dell’Equipaggio erano in banchina, indaffarati a riconoscere tra gli allievi schierati i propri congiunti: impresa ardua, se non impossibile, distinguerli nell’ordinato “disordine” in cui si affancendavano gli uomini. Si affollavano anche i livornesi che salutavano affettuosamente le “loro” Navi. I gabbieri , addetti ai pennoni erano già in prossimità dei bastingaggi pronti abalzare sulle sartie prospicienti all’albero cui erano destinati. Il gruppo dei Nostromi era anch’esso pronto a tradurre gli ordini del Comandante in “modulati fischi” da tutti riconoscibili e pronti ad eseguire. In banchina la Banda dell’Accademia scandiva le note degli inni tanto cari ai Marinai mentre i giovani Allievi cominciavano ad orecchiare. Dopo la festosa partenza le navi fecero rotta verso lo stretto di Gibilterra. Prima tappa Ceuta , poi appena attraversato lo Stretto, le navi, spinte dagli alisei di NE, fecero rotta per le Canarie; lasciata Las Palmas diressero verso Port Hamilton nelle Bermuda. Da qui, in assenza di venti propizi, procedettero con navigazione mista, a vela e motore. Poi, a vele spiegate, fecero rotta per la baia di Chesapeake , durante la permanenza nel porto di Baltimora, le due navi vennero visitate da migliaia di persone e l’equipaggio ricevette calorosi festeggiamenti dalle autorità e dalla popolazione locale ; risalito a motore il fiume Delaware, giunsero a Philadelphia, . Una comandata di allievi ed Equipaggio visitò Washington. Ridiscesero il Delaware, con vento di “gran largo” e giunsero a New York. Nel breve filmato dell’Istituto si vede la partenza delle due navi scuola dal porto di New York. Inizia il viaggio di ritorno delle Navi Scuola. Ho immaginato de due navi che, partite da Gibilterra dove avevano sostato 2 giorni, si avviano con rotta est verso Gaeta. In primo piano una barca da trasporto Spagnola, con armo latino si avvicina sopravvento al ” Colombo” che procede con il vento in poppa , più lontano il Vespucci. IL cielo gonfio di nubi portate dal vento umido che proviene dall’atlantico appare minaccioso, ma un o squarcio di luce tra le nubi illumina il soggetto principale. Se sei interessato invia una mail di prenotazione, o una richiesta di informazioni. That of 1933 was the third Campaign of the Navi School Division (Vespucci – Commander of the Panunzio and Colombo CV – Commander of the CF Bona), the second to the Command of Admiral Bernotti (commander of the Royal Naval Academy of the time). After the launch of the Colombo ship in 1928 there was the construction of the Vespucci (launched in 1931) and then the naval group was established. On 29 June 1933 after the flag raises, with the students of the 1st class of the Naval Academy and the crew already at the “maneuvering station” and the workers in the flying maneuvers with the peaks ready, the Navi School Division was preparing to leave the port of Livorno. As usual, the relatives of the Allievi and the Crew were on the quay, busy in recognizing their relatives among the students: a difficult task, if not impossible, to distinguish them in the orderly “disorder” in which men were hired. The Livornesi also flocked affectionately to their “Ships”. The seafarers, assigned to the flagpoles, were already in the vicinity of the ready-to-drive lines, which had to be pushed over the shrouds facing the tree to which they were intended. The Nostromi group was also ready to translate the Commander’s orders into “modulated whistles” by all recognizable and ready to perform. On the quay the Academy Band punctuated the notes of the hymns so dear to the sailors while the young students began to nibble. After the festive departure, the ships headed for the Strait of Gibraltar. First stage Ceuta, then just across the Strait, the ships, driven by the NE trade winds, headed for the Canaries; left Las Palmas heading towards Port Hamilton in Bermuda. From here, in the absence of favorable winds, they proceeded with mixed navigation, sailing and motor. 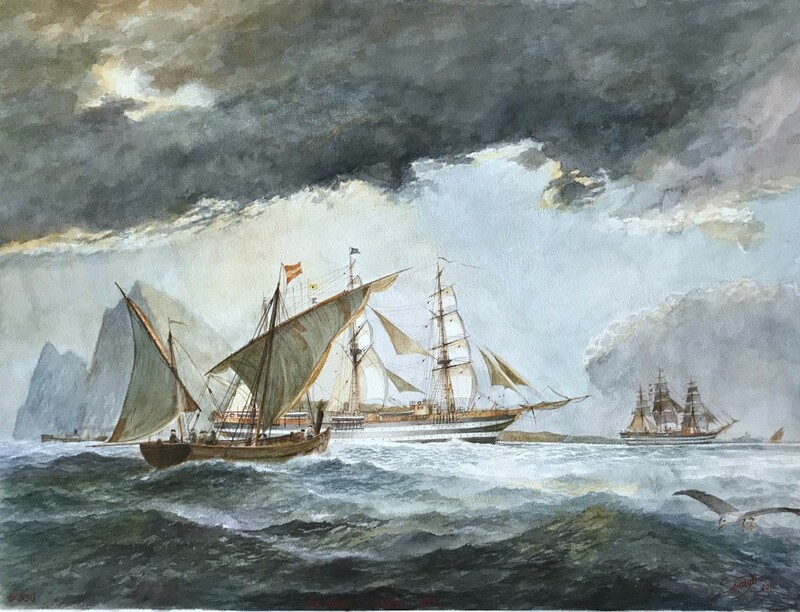 Then, under full sail, they broke through the Chesapeake Bay, while they were in Baltimore’s harbor, the two ships were visited by thousands of people and the crew received warm celebrations from the authorities and the local population; motorized the Delaware River, they arrived in Philadelphia,. A group of students and crew visited Washington. They retreated the Delaware, with a “great” wind and arrived in New York. In New York, on September 1, 1933, the arrival of “Colombo” and “Vespucci” coincided with the presence in that port of our submarines and of our torpedo boats that had escorted the Italo Balbo’s Air Cruise of the Decennial ; also just a few days before the Italian Transatlantic REX had won the “Blue Ribbon” for the fastest crossing from Gibraltar to New York, from 11 to 16 August (4 days, 13 h, 58m), a title that held until 1935. In the short film of the Institute we see the departure of the two school ships from the port of New York. The return journey of the School Ships begins. Exceeded the “twenty variables of Cancer”, pushed by the “winds of the West”, directed on Punta Delgada in the Azores Archipelago. From there, always sailing, they focused on Lisbon. 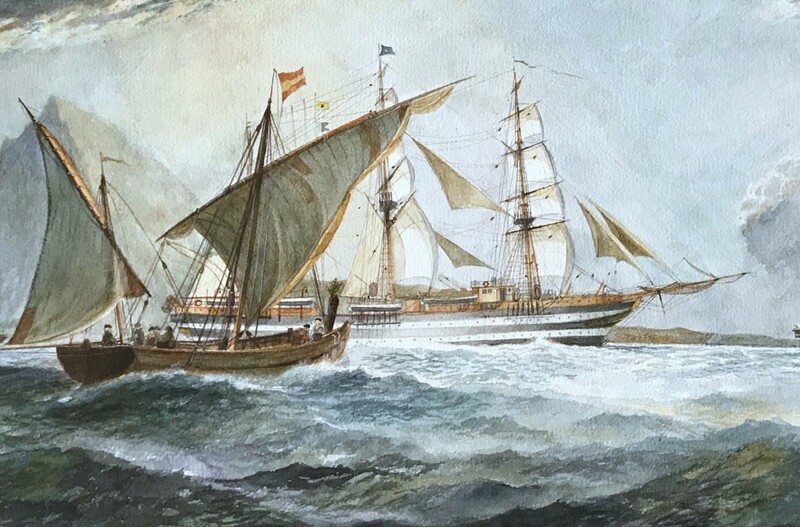 Leaving the Lusitanian harbor, proceeding to sail until the cross of Cape St. Vincent, they stayed for two days in Gibraltar. Finally, along some sailing sections (north of Algeria and south of Cagliari), they made a stop in Gaeta before reaching the always hospitable port of Livorno. 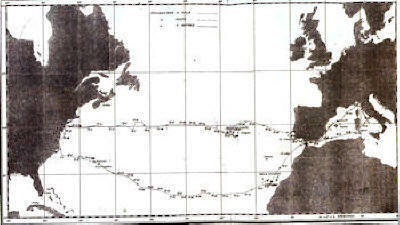 During the third Campaign of Education the two School Ships traveled 7,000 miles and stopped, in addition to the national ports, in eight foreign locations of seven nations. In all the ports affected, the School Ship Division was the subject of celebrations with many visitors on board. I imagined two ships that, departing from Gibraltar where they had stopped for 2 days, they started with east course towards Gaeta. 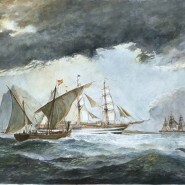 In the foreground a Spanish transport boat, with a Latin arm, approaches windward to the “Colombo” that proceeds with the wind in the stern, further the Vespucci. The sky full of clouds carried by the wet wind coming from the Atlantic appears threatening, but a gash of light in the clouds illuminates the main subject.